The individuals who work in Wyoming’s oil and gas industry take environmental responsibility very seriously. Not only is it the right thing to do, but the vast majority of those who work in the fields are Wyomingites through and through. You know what that means. They love this state, the outdoors, the wildlife, the wide open spaces, and the crisp cool air. Ensuring that these things continue to exist in great abundance for our kids and grandkids is a bedrock principle. We know that as a major employer in the state, oil and gas operators provide thousands of our fellow Wyomingites with good, high paying jobs and a quality way of life. Ensuring that our neighbors of today can provide for themselves and their families, and have the means to be active participants in their communities is also a bedrock principle. The good news is these principles are not in conflict. We can produce the energy Americans and the world needs while continuing to leave Wyoming a better place. We are proud of our role in building a strong and vibrant Wyoming while also ensuring our wild and open spaces stay wild and open. Wyoming’s clean air must be protected, and oil and natural gas producers are implementing new technologies to not only comply with existing stringent Wyoming rules regarding air quality but to exceed them. The Wyoming Department of Environmental Quality (DEQ) regulates Wyoming’s oil and natural gas companies, following authority delegated to the state from the United States Environmental Protection Agency (EPA). Most oil and natural gas operations are regulated by the rules in DEQ’s Chapter 6, Section 2. The DEQ requires minor source oil and natural gas operations to be evaluated for potential emissions and issues permits. These permits apply stringent Best Available Control Technology (BACT) to ensure the least amount of emissions are released into the clean Wyoming air. Wyoming’s oil and gas operators go to great lengths, often voluntarily, to ensure that operations are the cleanest, most efficient they can be. 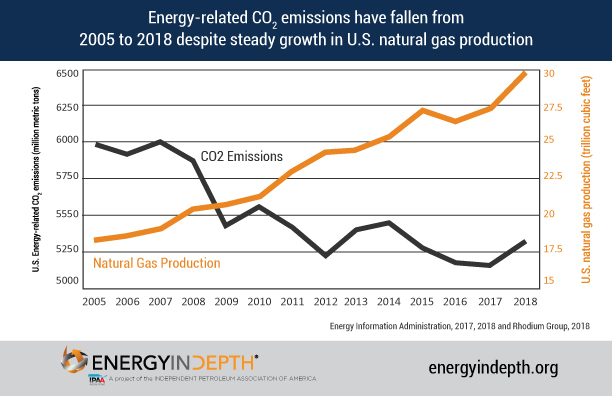 For example, extraordinary efforts in the Upper Green River Basin by oil and gas operators have led to a significant decline in ozone emissions. And nationally, carbon emissions have declined precipitously even has production has risen. To monitor and provide information to the public and other stakeholders on our state’s air quality, the Wyoming Air Quality Monitoring Network website features live images and current air quality conditions from monitoring locations throughout Wyoming. Images are updated every 15 minutes, and meteorological, air quality and visibility information is presented in near real time. In areas where produced water is of good enough quality to be used by livestock and wildlife, produced water is utilized in agricultural operations and providing habitat that otherwise would not exist. There are perennial streams in Wyoming that are solely dependent on produced water. These streams – streams with water rights attached – would not exist if not for oil production facilities. Oil and gas operations do not last forever. In fact, the most intense impacts to the land happen during the initial drilling and completion phase. Prior to moving drilling equipment onto a location, a pad must be built. To build a pad, the land must be cleared of vegetation and flattened. After drilling and completion operations are finished and the production phase begins, reclamation efforts begin immediately. After the life cycle of a well is completed, plugging of the well and reclamation takes place. Reclamation efforts are ongoing until the disturbed area is recovered. Reclamation involves replacing the topsoil and reseeding the disturbed area with natural and native plants. The goal of reclamation is to restore the site and ecosystem functions of disturbed lands to their original use, often the result is wildlife habitat of a higher quality than before the drilling ever occurred. Precipitation rates, soil organic matter, and biomass in Wyoming are low, making successful reclamation of disturbed lands challenging. Oil and gas operators spend significant resources on scientific data and research that helps to improve reclamation efforts. Greater Sage-Grouse populations declined over the past century prompting consideration for the bird to be listed under the Endangered Species Act. As the epicenter of sage grouse habitat, the State of Wyoming took a proactive approach to providing protection for Greater Sage-Grouse and their habitat. In coordination with the oil and gas industry and other stakeholders, Wyoming developed the unique and envied Wyoming Core Area Strategy. The strategy prioritizes prime Sage-Grouse habitat and populations and encourages resource development in other areas. The strategy also takes a scientific approach to disturbance in order to allow development where impacts are minimal, and avoid development where impacts are great. To ensure the long-term viability of the strategy, Wyoming formed the Sage-Grouse Implementation Team (SGIT) as the stakeholder group that makes recommendations to the Governor regarding regulatory actions to conserve sage-grouse and protect their habitat from threats. The oil and natural gas industry understands the importance of efforts to protect Sage-Grouse and has consistently adhered to state and federal policies aimed at conserving the species. For example, oil and gas activity comes to a halt during critical times of year for the Sage-Grouse to support their reproductive viability. Industry also continues to be an active member of the SGIT and is especially conscious of how activities are conducted in core population areas which consist of the best Sage-Grouse habitat in the Wyoming. Hunting in Wyoming is both a way of life and an important segment of the state’s economy. Many Wyoming residents working in the oil and gas industry are avid hunters and have a vested interest in protecting the viability of big game herds. New knowledge of the importance of migration corridors to Wyoming’s ungulates prompted the Wyoming Game and Fish Department to create an Ungulate Migration Corridor Strategy in 2016 which includes the step-by-step process for the formal designation of migration corridors. The Strategy was developed in coordination with various stakeholders, including conservation groups and the oil and gas industry, as a way to manage activities and development located in migration corridors on a project-specific basis through avoidance and minimization. The oil and gas industry understands the importance of wildlife to the state and believes protection of migration corridor functionality is necessary. The science is not clear on how different species of large ungulates migrate, and what level of impacts negatively affect their movements. More data is necessary to clearly understand these issues, and work is still being conducted in this field. In the meantime, oil and gas operators continue to be actively involved with the state and stakeholders as policies are developed to ensure that wildlife remain viable and vibrant, and prudent development can occur.